As we continue our struggle to finally finish version 3.0 of AdGuard for Android, the app receives more and more intermediate updates as a byproduct :) Today we present v2.11, a big update, at least judging by the number of entries in the changelog. Two 'whales' that I'll stop by today are integration with web reporting tool and implementation of AG Assistant. Both of these new features will, hopefully, make AdGuard more convenient in everyday use, especially for advanced users. Be it reporting a missed ad or managing the filtering process, it will take fewer actions to perform from now on and, therefore, save you time. 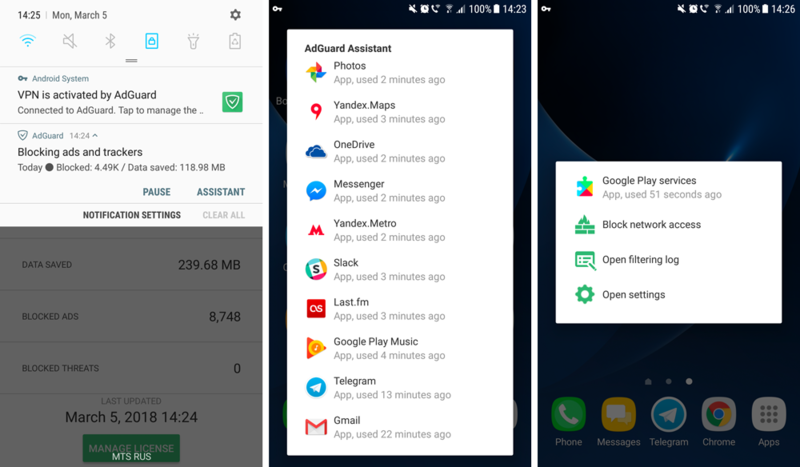 If you've already installed the update, try to drag down on the AdGuard notification. You will notice there are two new action buttons. One is “Pause”, which pauses the protection upon tapping (tap again on the notification to resume it), but the more interesting one is “Assistant”. When you tap it, a list of recently used apps and websites will show up. Tap on any of them for more options, like opening filtering log, denying the app network access (or whitelisting/blacklisting in case of a website), or proceeding to the app/website-specific settings screen in Apps Management. This feature is already familiar to AdGuard for Windows, AdGuard for iOS and AdGuard browser extension users. Basically, this is a way to report any filtering-related issue on a page: missed ad, false positive etc. To do so, go to app’s side menu and select “Report an issue”. Instead of an immediate “Send a message to support” screen, you will get a dialog to choose the issue type. Choosing one of the filtering-related issue types will open a web page and a wizard will take you step by step through the process of filling in the required information. Don’t worry, most of the fields will be pre-filled by the AdGuard app! This way of reporting missed ads and other filter-related problems is beneficial to both users and filter developers — the latter will get all the information they need to fix the problem, and users will be sure that the issue is going to be resolved in the shortest amount of time possible. NOTE: we haven't turned on the auto-update yet, but we will soon, probably on Monday. For now you can manually trigger the update by tapping the "Check for updates" button in the top-right corner of the main screen. The full changelog is quite lengthy, and mostly consists of bugfixes. Most curious will find it on GitHub in its full glory. Had a chance to give Assistant or reporting tool a try already? What are your thoughts on the new features? Let us know in the comments, it is your feedback that moves the app forward! According to the PageFair 2014 report, Google Chrome is a major driver of adblock growth. 20% of users discovered ad blocking by browsing “available browser extensions”. Given how popular ad blocking is, it is quite a lot. This also explains why "cloning" wide-spread ad blockers has become so popular among online crooks. Seven months ago big news broke: 37,000 users were tricked into installing a fake Adblock Plus extension. What if I told you that thanks to poor Chrome's WebStore moderation the situation is much worse, and in reality over 20,000,000 users are affected and tricked into installing fake malicious ad blockers? In our day and age, it is becoming increasingly important to have access to any online resources that you need, at any time. This is not always convenient or even possible at all — take such example as using a network with overly restrictive firewall. What will help you be 100% sure you can access any website is setting up your own proxy. Not to mention proxy will hide your IP and let you access geo-blocked websites. In this article, we will walk together all the way from renting our own server to configuring proxy on a mobile device or in a browser.